Jenna McCurdy, the new athletic trainer at Bonny Eagle High School, is on a mission to prevent as many injuries as possible. Ms. McCurdy currently sees anywhere from 20 to 30 students daily, for things such as taping, wrapping, evaluations and rehab. She also works hard to get kids back in play as soon as possible. Ms. McCurdy has been involved in athletic training for about six years. She graduated in 2008 from Husson University with Bachelor's degrees in health science and psychology. She went on to graduate in 2010 from Bridgewater State College with a Masters degree in athletic training. Prior to coming to Bonny Eagle, she worked at Freeport High School and for an orthopedic company. Last year’s athletic trainer was Mr. Zach Chase, who now works at the United Medical Gym in South Portland. His departure forced the BEHS athletic department to search for a replacement. Athletic Director Eric Curtis said he interviewed some great candidates, but also that Ms. McCurdy had a little more confidence that showed in the interviews. “It was a team decision,” said Mr. Curtis. The team which made the decision was composed of two administrators, a school board member, two coaches, and two student athletes. 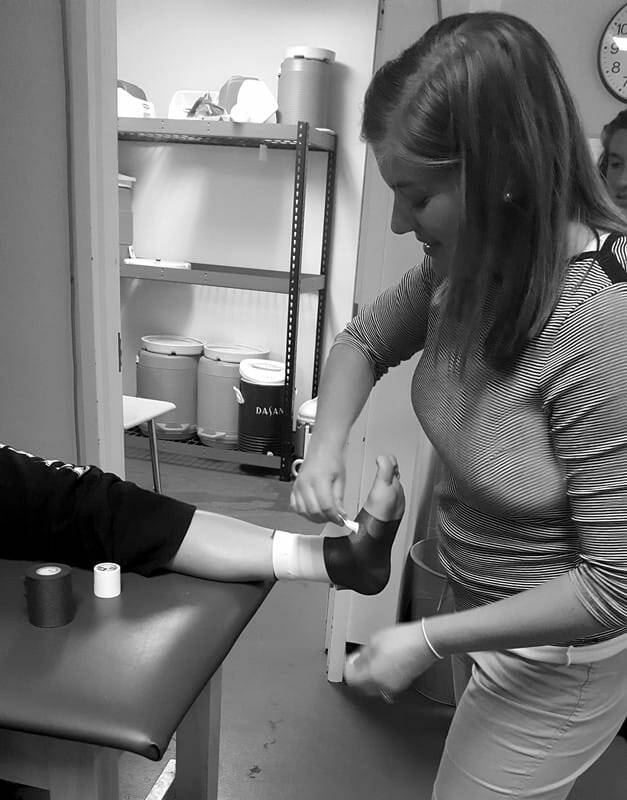 Athletic trainer Ms. Jenna McCurdy wraps the injured foot of an athlete in a bandage. She says athletes need to speak up when they think they might have injured themselves. Ms. McCurdy, who has had a busy start to her debut at BE, has accepted the fact that most athletes do not know much about injury prevention. 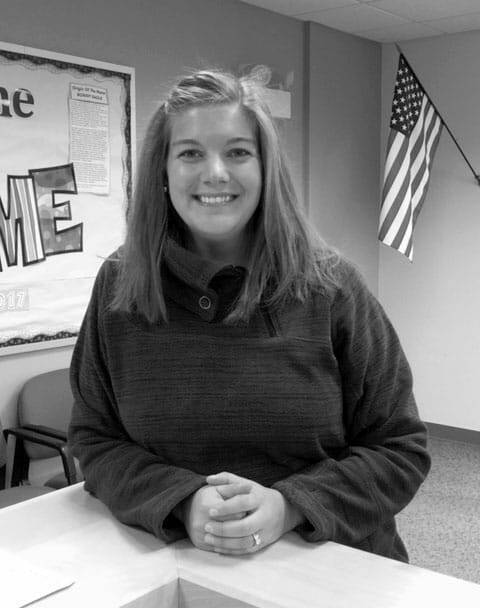 She believes it is up to her, along with other staff at Bonny Eagle, to help them become more educated. Ms. McCurdy’s number one tip to injury prevention is honesty if you have something going on. ​ She also explains how hiding the pain is not going to do anything but increase the risk for another injury on top of just making the original trauma worse. Ms. McCurdy goes on to explain that while many injuries can be prevented, others are bound to happen. Junior football player, Liam Willey, is an example. While participating in pre-season training camp, he collided in mid air with an opposing player. Willey now has a sprained ankle and broken fibula. He recalls the incident, saying he “heard a pop” after going up for a catch and having an opposing player try swatting at him. They came down together, resulting in an awkward landing. Ms. McCurdy has been busy thus far, with a large majority of injuries coming from the cross country teams. Ms. McCurdy says there is no rhyme or reason to why there are so many injuries coming from cross country, but she is determined to find out. She suggests that perhaps it is the lack of stretching. Running is strenuous on the body and without proper stretching, injuries are very likely to occur. Jake Cook, a senior at BEHS agrees with Ms. McCurdy’s statement. "I was running and pulled my hip flexor… the injury was probably caused by my lack of flexibility and the fact that I rarely ever stretch,” Jake said. He also added that his hip flexor had been bothering him before he went for the run. Even though he was feeling pain, he said, “I like to give it my all until I physically can’t,” Jake said. ​ Ms. McCurdy says that some of the injuries come about partly because sports can be “super competitive, and kids want to prove themselves.” Ms. McCurdy also touches upon the subject of stretching, both dynamic and static routines. “Finding a good balance between the two (dynamic and static), is important,” she says. “The dynamic piece is really important in terms of getting the blood flowing, activating your muscles, increasing your heart rate...but taking the time to stretch certain things that may be sore or tight is also important.” She adds that injuries in stretching are very common because lots of athletes don’t think it’s that important to do. Ms. McCurdy says that she is enjoying her job, adding that she is getting to know more students every day and that the coaches have been really good to work with. The kids and staff enjoy her presence as well. “She seems to be fitting in well at BE,” said Mr. Curtis.